The optic nerve represents the cable connecting the eye to the brain, carrying all of the information from the retina that we need to see. Like the wire connecting your TV to the cable box, the optic nerve has insulation around it called myelin. 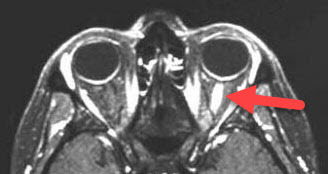 During an acute episode of optic neuritis, a person’s own immune system attacks this myelin insulation. Optic neuritis is more common in young females and is often associated with a neurologic condition called multiple sclerosis (MS). While optic neuritis is one of the criteria used in diagnosing MS, a single episode does not mean that a patient has MS. A diagnosis of MS should only be made by a neurologist. Patients already diagnosed with MS are at a much higher risk for developing optic neuritis. Patient usually complain initially of a dull ache in one eye that is usually worse with eye movement. Vision is usually decreased in the affected eye, varying form mild distortion to severe blurriness. Patients may also complain of flashing lights and possible changes in color vision. A comprehensive dilated eye exam is performed looking for optic nerve swelling, although this is usually absent or mild. Often the nerve inflammation can occur behind the eye, making it difficult to find during your eye exam. Color vision and visual field testing are often abnormal. An MRI scan of the optic nerves and brain is usually diagnostic. The MRI is also useful in ruling out many other problems that can cause optic nerve swelling such as pseudotumor cerebri, tumors, and infections. Optic neuritis is typically managed with a team of specialists including your eye doctor and a neurologist. Thankfully, vision and eye pain typically resolve on their own within weeks to months. If the vision loss or eye pain is severe, intravenous steroids may be administered by your healthcare team in order to speed in the recovery. However, treatment probably has no long term effect on vision, in preventing recurrences or in delaying the development of MS. While the overwhelming majority of patients regain a large amount of vision, optic neuritis can recur in either the initially affected or other eye. This risk is even higher in patients with MS.